Every year's October month, you will see pink ribbons everywhere and even pink lighting buildings around, because it is the Breast Cancer month and people from all industries every corner of the world is doing their best to create Breast Awareness Campaign, same goes to The Estēe Lauder Companies that goes all out in supporting their Breast Awareness Campaign, to unite as one and come together to triumph over the disease. 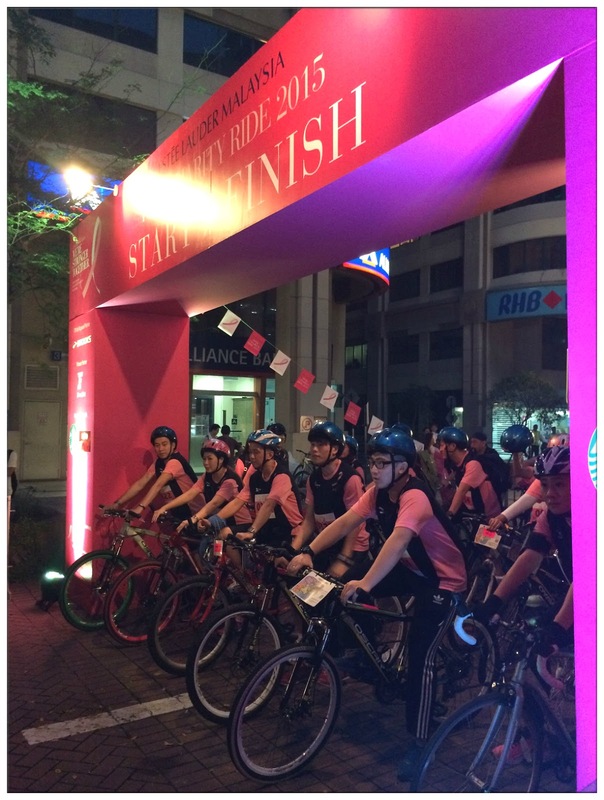 As for year 2015, I am glad to be a part of the Pink Charity Ride that took part on 17th October. 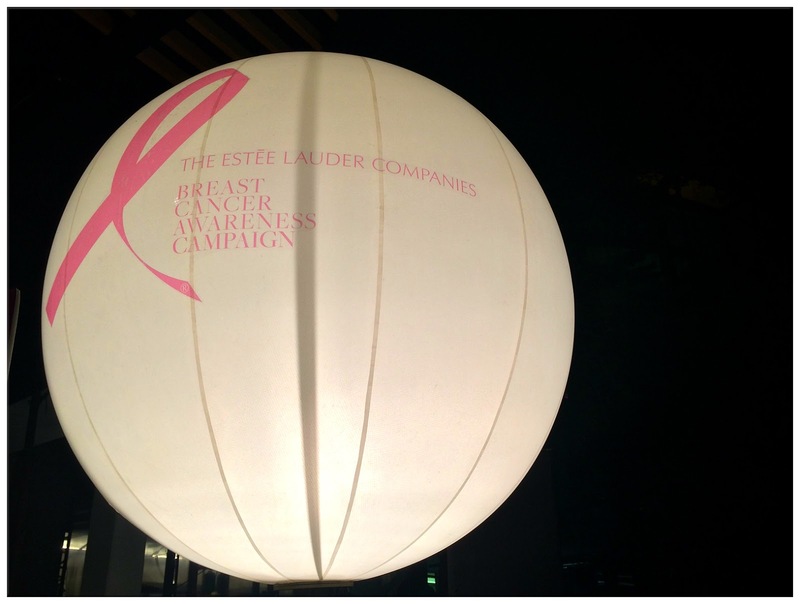 It is to support Estēe Lauder Malaysia's effort to raise awareness about breast cancer with Malaysians as well as raise funds for charitable beneficiaries. 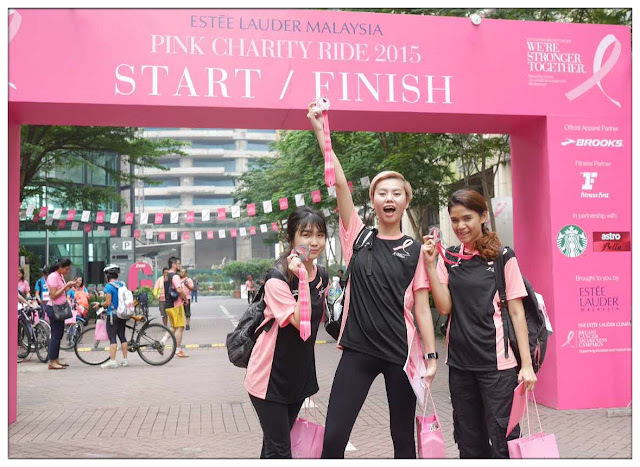 In year 2014, RM600,000 was raised to support Cancer Research Malaysia (Initially known as The Cancer Research Initiatives Foundation, CARIF)m The National Cancer Society Malaysia, The College of Radiology Malaysia and also The Breast Cancer Welfare Association. 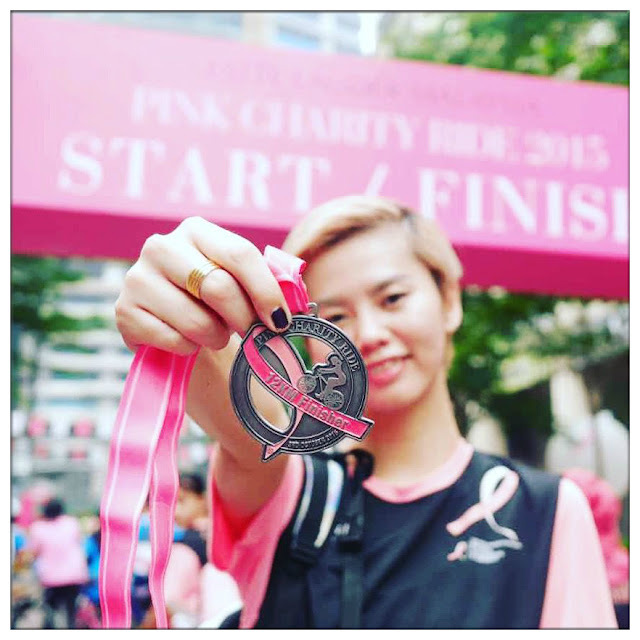 Each and every cent was spent on further strengthen efforts on medical researches, education and even offer free mammograms and support for survivors. Pink and black, looking good! 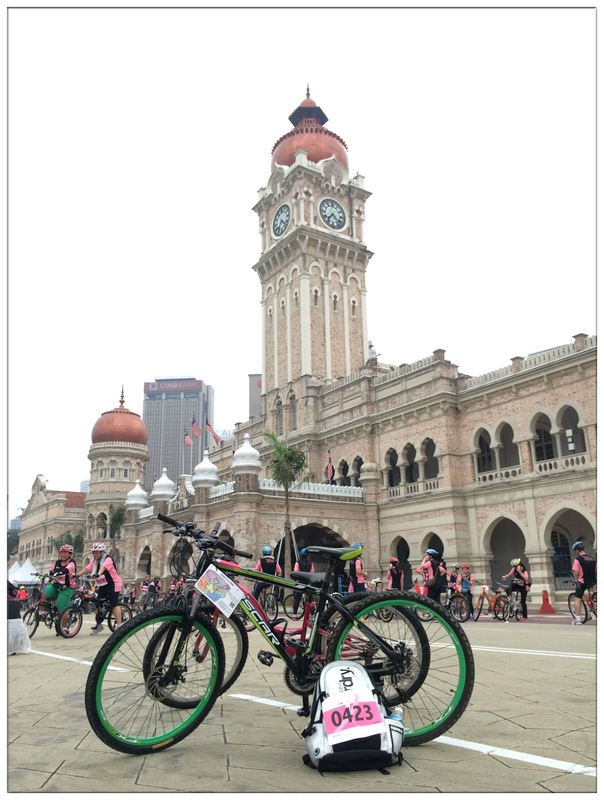 Pink Charity Ride is one of among the many Breast Cancer Awareness activities that Estēe Lauder Malaysia organize and welcomed all cyclists aged 18 and above to experience a fun ride from MidValley Megamall to Dataran Merdeka and back and also at the same time contributing a good cause as each tickets was priced at RM80 and proceeds were donated to the beneficiaries. 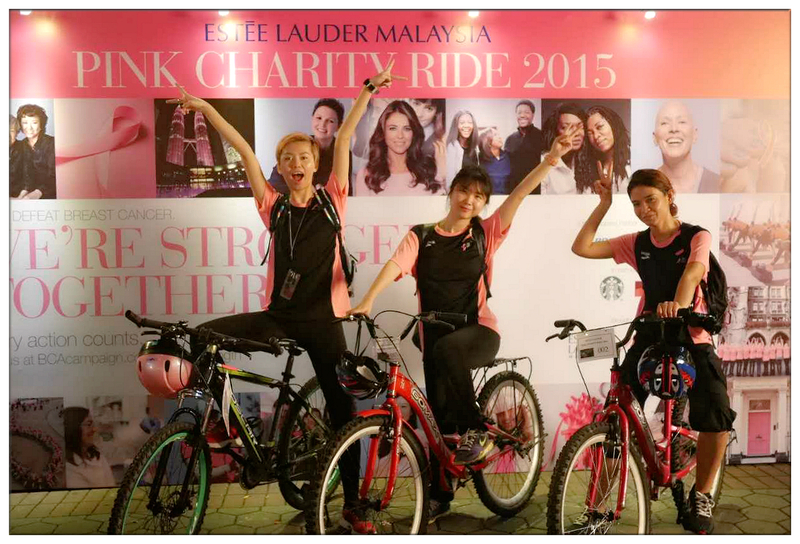 Since it's a good cause, I dragged Jean to come with me and als Fatin were also invited to Pink Charity Ride. 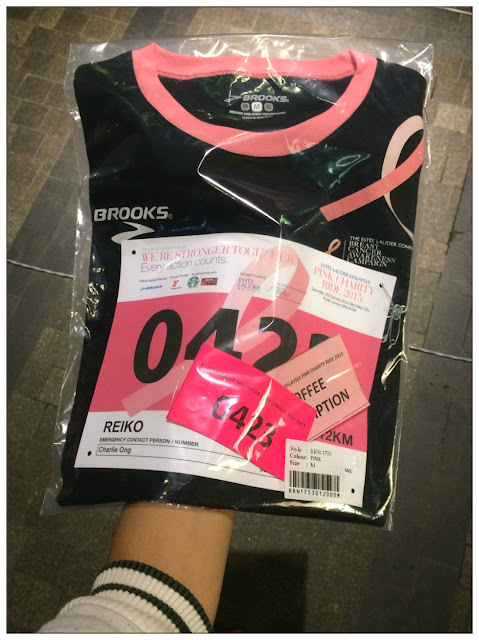 We were all so hyper to change and pin on our bib number on our shirts and belongings, not to mention taking photos nonstop to keep as precious memories for this event. This year, Esteēe Lauder Malaysia embraces the theme "Every Action Counts" through strategic collaborations and exciting activities in order to raise more awareness throughout Malaysia and raise fund for charitable bodies. The theme is inspired by the belief that only with greater awareness on breast cancer, more people will be able to aware how deadly the disease is if left unaware and untreated and able to take the right action and make the next the right step in order to prevent the disease or to lend a helping hand to others. It was a 12KM ride and no special prize for those who finished first so me, Jean and Fatin decided to do it leisurely instead of competitively. For someone who doesn't do regular exercise like me, 12KM of cycling is a very long journey, especially when you gotta cycle up the slopes and all, I really gave up and got off from the bike and push it up the slope instead of cycle it up. I reckon that's the best I can do, sometimes pushed yourself too hard for something you knew that's not going to happen is really pointless. What matter most is that take your time, do it within your limit and don't give up. Initially I thought: 12KM only, what a breeze! But it is not, I underestimated the distance, and of course the road condition. It was hard when you're behind of the squad, trying to catch up and things doesn't happen like how you imagined. All thanks to the patient course marshals throughout the ride to always ensure our safety that morning. The ride wasn't easy and at some points, there are some reckless drivers just drive past the marshal just to get on his way. 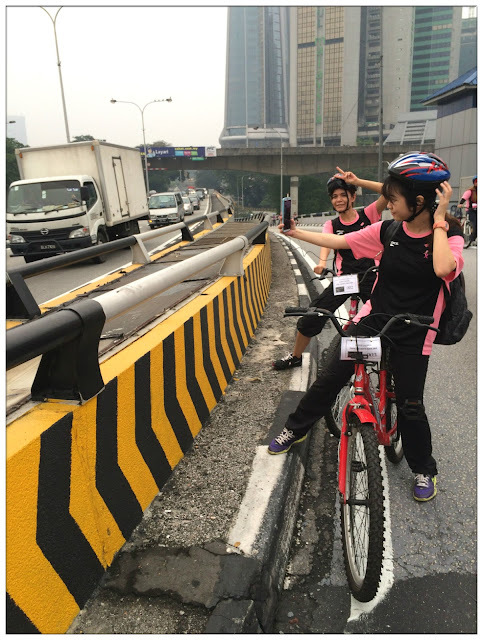 It jeopardized the safety of marshal, riders and also the driver themselves. 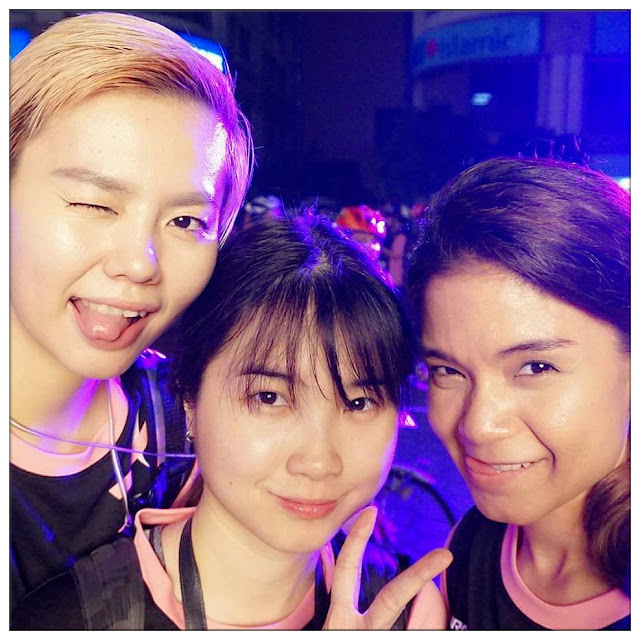 Next time if you saw a marathon/cycling event going on, please do bear in mind to be patient and calm as they are trying their best to go to finish line, and we have our loved ones too like you do. Good news is I didn't end up last, bad news is I'm the worst among three of us! The achievement unlocked feeling when I reach the finishing line is seriously overwhelming, and I kinda get a hold of how those who trained so hard for marathons feels when their hard work pays off. The overwhelming feeling that fills up your heart means everything at that very moment! I guess moments like this makes you feel that your life is meaningful in its own way! And I ought to fill my life with more moments like this! It is through events like this I realized how much it means of the theme "Every Action Counts" and also the slogan "We're Stronger Together". Be it pin a pink ribbon on your attire on Pink October month in honor of a friend or to salute breast cancer survivor for the struggles they've been through, or donate to a charitable body for researches and volunteers effort, every action represents a meaning and it may be mean a lot to people who needed the support be it morally, physically or financially. To create awareness for breast cancer for early detection, cure and also prevention needs a big amount of effort from everyone in the society. Let's do our part for the people we love, for loving ourselves, and also to the many generations to come! 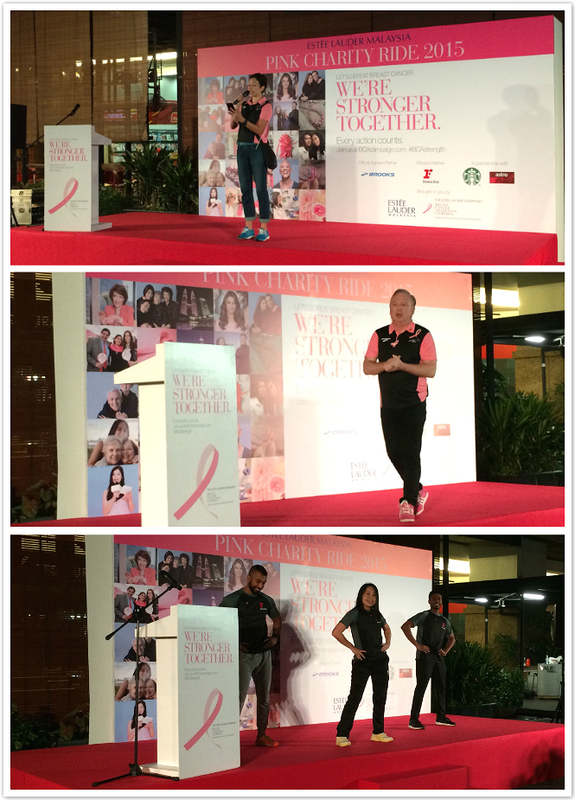 Thank you Estēe Lauder Malaysia for inviting me to such a meaningful event. 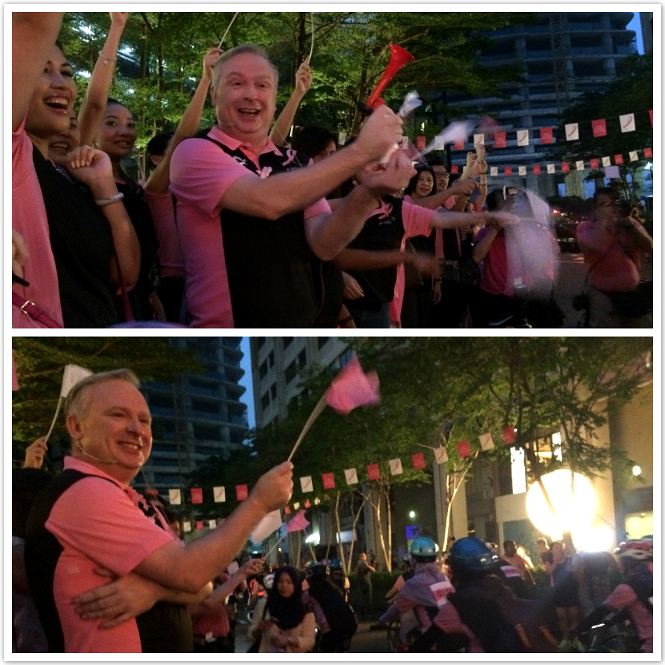 Hope to be a part of the campaign again in year 2016! super fun time!!!! hope there's more event like this!